The economist wrote a telling article titled Industrialisation in Africa on what can only be described as the deindustrialization of Africa. One of the critical constraints that have prevented Africa from development has been a narrow manufacturing base. Exporting resources and commodities only gives you a small piece of the value chain. So the question must be: is Africa expanding its industrial and manufacturing sectors? The worrying answer seems to be a no. Over the past 15 years sub-Saharan African economies have expanded at an average rate of about 5% a year, enough to have doubled output over the period. They were helped largely by a commodities boom that was caused, in part, by rapid urbanisation in China. As China’s economy has slowed, the prices of many commodities mined in Africa have slumped again. Copper, for instance, now sells for about half as much as it did at its peak. This, in turn, is hitting Africa’s growth: the IMF reckons it will slip to under 4% this year, leading many to fret that a harmful old pattern of commodity-driven boom and bust in Africa is about to repeat itself. 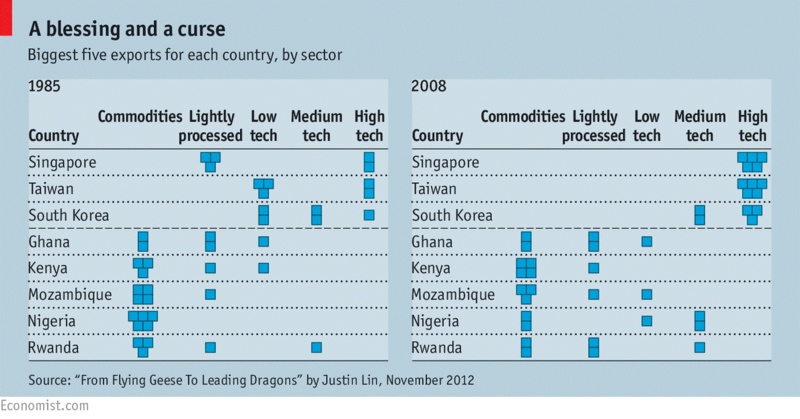 One of the main reasons to worry is that Africa’s manufacturing industry has largely missed out on the boom. The commodities boom was largely responsible for Africa’s economic growth, however this was not enough to produce a surplus that could be invested into expanding manufacturing sector. Considering that Africa was still importing more valuable finished goods with income from the cheaper raw materials exported it still had an unfavourable trade balance. Something which has not changed since the 1980s. A worrying concern is how Africa had a better share of world exports in the 50’s when compared to East Asia, yet Asia managed to expand and surpass Africa greatly. No doubt this is due to East Asia’s highly industrialised electronics and technology sectors. So what are some of the challenges that have faced Africa? “The African Development Bank found in 2010 that electricity, a large cost for most manufacturers, costs three times more on average in Africa than it does even in South Asia. Poor roads and congested ports also drive up the cost of moving raw materials about and shipping out finished goods. Africa’s final snag is its geography. East Asia’s string of successes happened under the “flying geese” model of development, where a “lead” country creates a slipstream for others to follow. This happened first in the 1970s, when Japan moved labour-intensive manufacturing to Taiwan and South Korea. No single African country has emerged to become dominant in manufacturing and technology to allow other countries to ride the coat tails of success. I would have expected South Africa to take the lead in this area, however even South Africa has struggled to grow its manufacturing sector significantly. However they highlight there are countries that are promising, such as Ethiopia, Tanzania and Rwanda which has a focused policy that has looked at investing and developing specific industrial areas rather than spreading investment across the whole country. A model perhaps others can adopt. However I am surprised that the article does not mention other critical factors such as the crippling debt crisis caused by declining commodity prices, high interest rates and oil shocks in the 70s. The debt crisis meant funds had to service debts instead of investing in development and industries. The second critical factor was the Structural Adjustment Programmes (SAPs) developed by the World Bank and IMF which African countries implemented in order to get debt relief and aid. SAP’s dictated much of the public policy of Africa up until 2005 has had little to show for it. 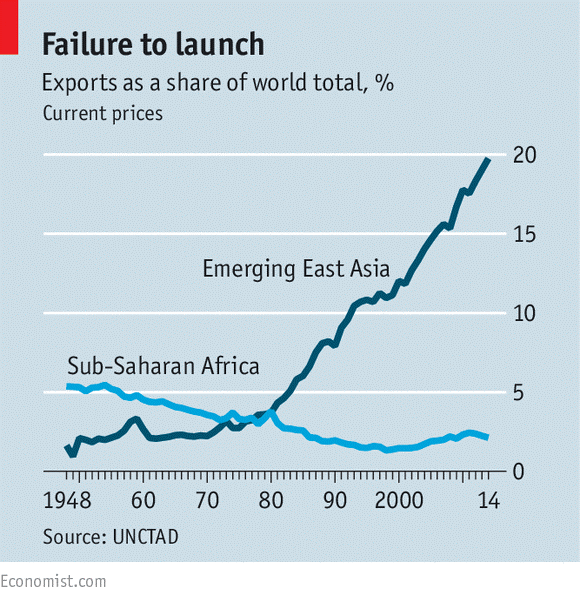 The economist says: “Africa’s growth is not driven by export-led manufacturing”. The SAPs were based on neo-liberal principles supported by the premise that the market is perfect and efficient at distributing resources. Export led growth of commodities was emphasized, import substitution (the very thing that could enable industrialisation) was removed and state intervention in the economy greatly reduced. How could industrialisation take-off in such an environment? The economist highlights convenient factors but neglects historically significant factors that have contributed to the lack of growth in Africa’s industrial sector. I do agree that with sub-Saharan Africa expected to house a significant portion of the world’s youth population, and urbanisation set to rapidly increase; job creation through industrialization will become imperative for the sustainability of African development. What do you think? Is the economist correct in their assessment? Next Next post: Should science be relied upon absolutely as it is inherently objective in its claim to truth?